Welcome to Narwhal, our 57ft steel expedition boat. Over the winter have been busy applying some elbow grease and TLC to get Narwhal ship-shape and ready to go on some amazing adventures in 2017. Check out Narwhal's log to see where we have been and what we have been up to. Take a look around below decks. Narwhal has twin forward cabins, each with two berths, and a large stern cabin. This is one of my favourite places, it makes me feel like I am onboard a pirate ship every time I walk in. 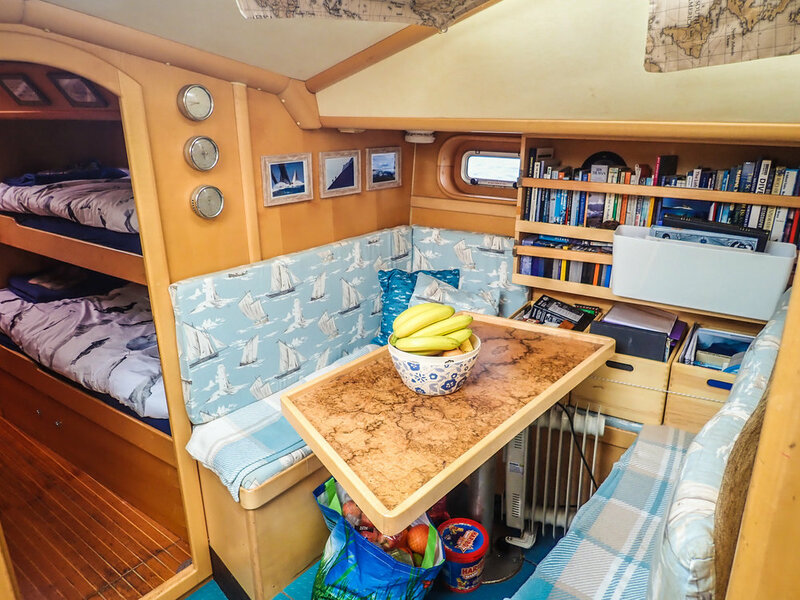 Narwhal also has a galley, a communal saloon and an extra cosy additional seating area. This is where the diesel heater is going to be installed. Hmm, comfy seating area and nice cosy heater... cup of tea and a good book anyone? The nav station is equipped for all eventualities; from the computer system with it's top of the line routing software for when we just have to get to the next adventure as quickly as possible. As well as the satellite communication system which means we can keep in touch via email wherever we are. To the paper charts, dividers and sextant for practicing our traditional skills. Don't forget to add the deviation, she is steel. Designed to be self sufficient whist sailing off-shore and exploring for extended periods in remote regions, Narwhal has a water-maker as well as large fresh water and fuel tanks and plenty of room to store food and all of the equipment necessary for adventuring when we reach our destination. If the wind doesn't blow then she has a 105hp Volvo engine to push us along and a generator to keep the lights on. One of our winter upgrades for Narwhal is a solar and wind power system to enable us to generate power more sustainably. 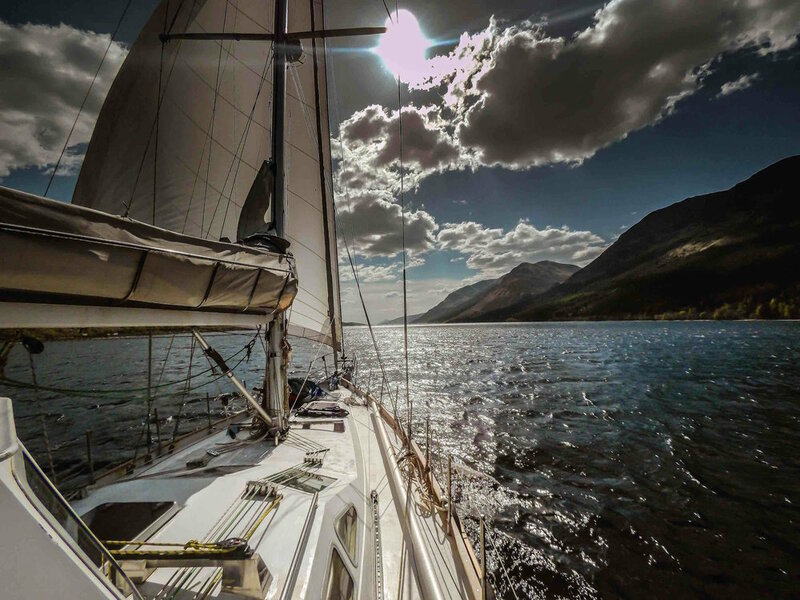 Equipped with all modern navigation and communications equipment. This is where narwhal’s adventures are planned. On deck Narwhal has a large cutter rig with full battened mainsail, furling genoa and furling self-tacking staysail. She has a dog house so that we can shelter out of the elements when things get chilly on deck. I am particularly looking forward to putting the 'dolphin spotting' pulpit on the bow to good use. She also has a swimming platform at the back, ideal for launching kayaks, SUPs or the odd foiling boat. Narwhal provides the perfect, self sufficient base whilst travelling for extended periods away from civilisation. 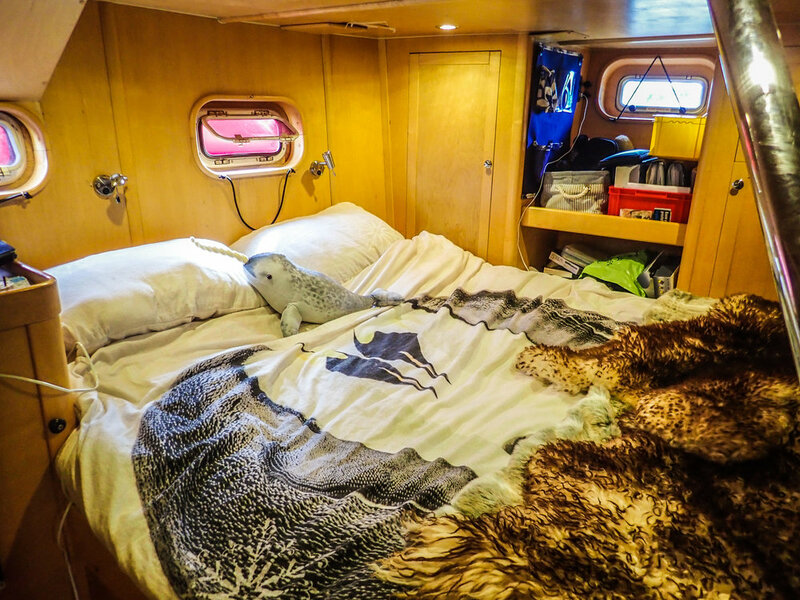 Narwhal has comfortable living and sleeping space for 6 people and plenty of room to stow your equipment. She provides warm and comfortable living accommodation, cooking facilities, room to work, plan, edit video footage and debrief, enabling you to get the most out of your adventure or research. 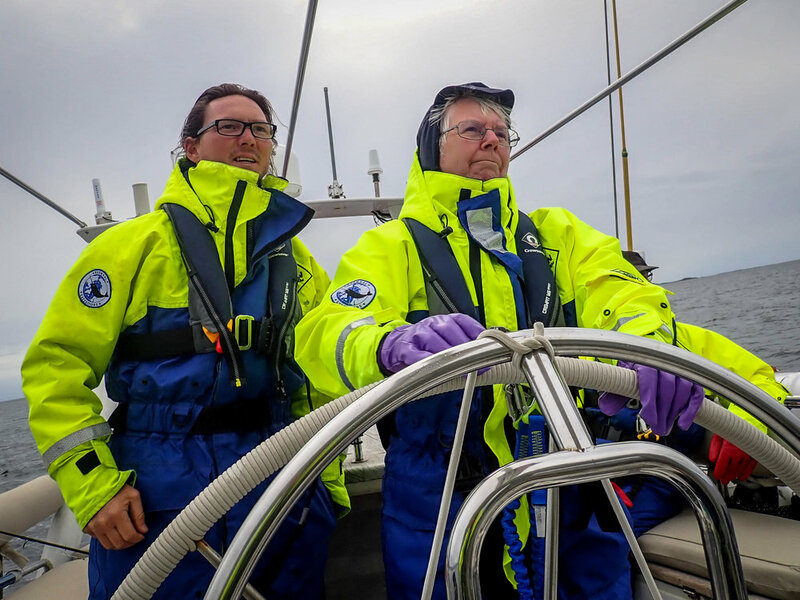 The boat is equipped with the latest satellite communications technology, we use these to get our weather reports and details of the latest ice conditions, but they also enable you to access your email accounts and share results, reports and updates with home and the rest of the world. There is plenty of space down below to stow expedition gear such as skis, mountaineering equipment, ice axes, filming equipment or dive gear. Her wide decks offer room to transport kayaks, surf boards, SUPs or bikes. The swimming platform at the rear of the boat makes launching kayaks or surf boards at any location easy. We also have a 4.3m rib which can ferry people and equipment to and from the shore.